CHASING FOOD DREAMS: Nescafe Dolce Gusto Introduces the New Marrakech Tea! 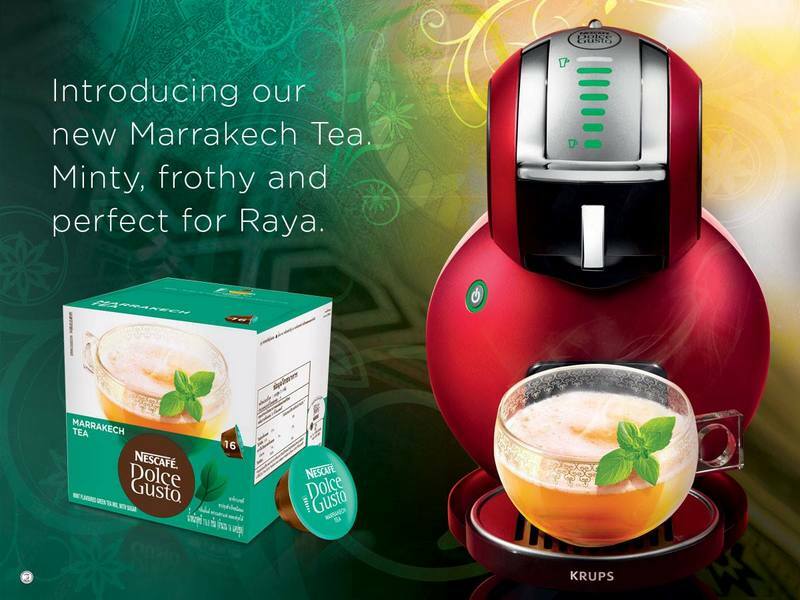 Nescafe Dolce Gusto Introduces the New Marrakech Tea! The New Marrakech Tea, Perfect for Anytime of the Day! Just in time for the coming Hari Raya, NESCAFÉ Dolce Gusto Malaysia introduces its latest addition to its tea range, The Marrakech Tea. I was handed a challenge to taste, enjoy and experience the new tea capsule by NESCAFÉ Dolce Gusto. I love tea, any kind for that matter. There is something soothing about it and makes me feel all warm and fuzzy when I drink it. So when I heard the NESCAFÉ Dolce Gusto has its own tea range, I simply couldn’t be any happier. The NESCAFÉ Dolce Gusto Mini Me arrived together with the Marrakech Tea at my doorstep a few days ago and right away, I couldn’t resist unpacking it and having a taste! The NESCAFÉ Dolce Gusto Mini Me is utterly cute in design, almost resembling a penguin. Don’t be fool by its size, this little fella is equip with a maximum 15 bar pump pressure to brew a great cuppa of joe or tea. Working the Mini Me is so easy that anyone can make a lovely cuppa with a few simple steps. The Marrakech Tea capsules come in a box of 16 pieces. After its successful range of teas in the form of Tea Latte, Chai Tea Latte and Green Tea Latte, the new Marrakech Tea features green tea with mint. The smart innovation of every NESCAFÉ Dolce Gusto capsule ensures that the right pressure is applied for the perfect cup of coffee or tea. After unpacking my Mini Me, I went straight into working mode to make my first cup of Marrakech Tea. First thing to do is to fill up the back plastic canister with water. Press the button on top of the Mini Me and wait for a green light. Don’t forget to put a cup at the tray and adjust the tray height accordingly. Lift the locking lever and pull out the capsule holder. Put in your choice of capsule and lock it back into the machine. Each capsule has its own indication on the box for the desired quantity of water. However, I would recommend that you adjust it to your own taste after tasting it for your own personal touch. Turn up the selection wheel to that water level. Flick the little joystick to get the Mini Me working. What's great is the option to have the Mini Me churn out hot or cold depending on your liking. When the Mini Me first finished the Marrakech Tea, I noticed a nice layer of white foam on top of the tea. The tea itself has a pale green straw color. A sip of the creamy foam and minty tea instantly has me reeling in thoughts of fuzzy warmness and freshness. The tea is light in flavour and smooth, a common characteristic of green tea. It is sweeten and freshen up with mint notes. It’s not overpowering but rather easy and subtle on the palate with a lovely earthy sense. Echoing the Moroccans who have been drinking mint tea for the longest time, I can understand why this tea is so addictive. I had my first one hot and a second cold. I find the cold one even more flavourful and refreshing. The next day was a weekend, so it was perfect for me to carry out my challenge. First thing in the morning, I brewed a hot Marrakech Tea and had it with some biscuits. Cream custard filled biscuit sandwiches to be exact to go with my hot mint tea. The combination worked like a charm. 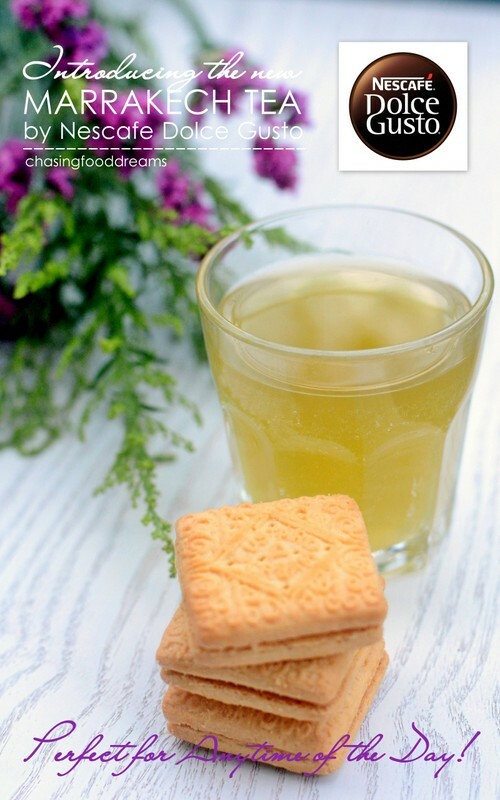 Sweet, creamy and buttery biscuits are simply delish with the minty hot tea. Though a bit sweet in combination, it is still perfect to charge up my morning with some extra sweetness. Fruits are great with the Marrakech Tea, rendering the same refreshing notes as the mint. Apples, red or green, makes lovely pairing or pineapple which always goes well with mint. Oranges added extra tang to the mint tea and jazz it up. Dried dates are even more perfect since it’s the holy month of fasting and this combination should warm up the tummy for a lovely early sahur or evening buka puasa feast. I snacked on some candies during brunch with a cold Marrakech Tea. I love chocolate candies or sour candies and these are perfect for the mint tea. Sweet candies may not work too well since it will only add sweetness to the tea whereas chocolate and sour ones brightened up the mint tea better. Lunch is simple, sandwiches or pastry usually. Enjoy an iced cold Marrakech Tea with light lunches or even rice and noodles. Anyway, the mint tea is great for cleansing the palate from a meal. In fact, I added more fresh mint to my cold tea for extra minty notes. Mint also aids digestion so it’s another great excuse to drink up the Marrakech Tea after a heavy meal. Tea time is my favorite. During that hour of the day, I find that tea helps to smooth out my day and provide some comfort in the late hot afternoon. The Marrakech Tea is lovely with cakes, pastries and scones. My cranberry scone was decent too. The tanginess of the dried cranberries in the buttery scones provided a nice balance of flavour to the mint tea while the savory buttery flavour in the scone gave the mint another side of taste. If only I have clotted cream or whipped cream with me, this pairing would have scored another plus point. Needless to say, I concluded that chocolate is the best pairing with the Marrakech Tea. There is something so deliriously satisfying when savoring dark rich chocolate with mint. The silky thick chocolate sometimes gets clogged in the throat so having the bright and minty Marrakech Tea helps to soothe and clear the throat after eating chocolates. There is also no perfect timing to eating chocolate and mint simply because it’s perfect any time of the day! Nuts are another great combination that I really enjoyed with my Marrakech Tea. I had some salted almonds with me and savoring this with the Marrakech Tea ended up being good because the sweetness of the mint tea balanced out the salty nutty flavours of the nuts. I also find almond a better combination since the aroma and flavour of the almond works wonder with the sweet earthy mint tea. In the evening, enjoying a hot cup of Marrakech Tea would be even more pleasurable. Savoring the earthy and soothing mint tea before or after a meal, especially during dinner, will certainly help with digestion and comfort. The minty tea helps to warm up the tummy before dinner and brighten up the palate after dinner. Either way, it’s a great drink, especially during the fasting month to bring up the tummy for food after a long day of fasting. Yes, I can be quite bad sometimes but snacking on chips does make me feel guilty at times. And so, I decided to treat myself that weekend to some potato chips with a glass of iced Marrakech Tea with my little one. 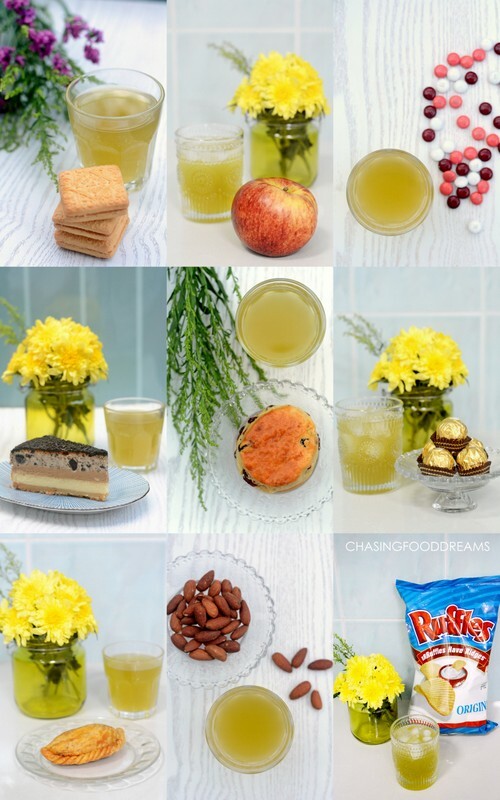 The iced cold mint tea is refreshing and welcoming after the salty flavours of the chips. Enjoy the gentle minty sweetness of the Marrakech Tea with snacks, dishes, pastries, chocolates, sweets and desserts any time of the day and you’ll find the Marrakech Tea absolutely soothing, earthy and comforting. 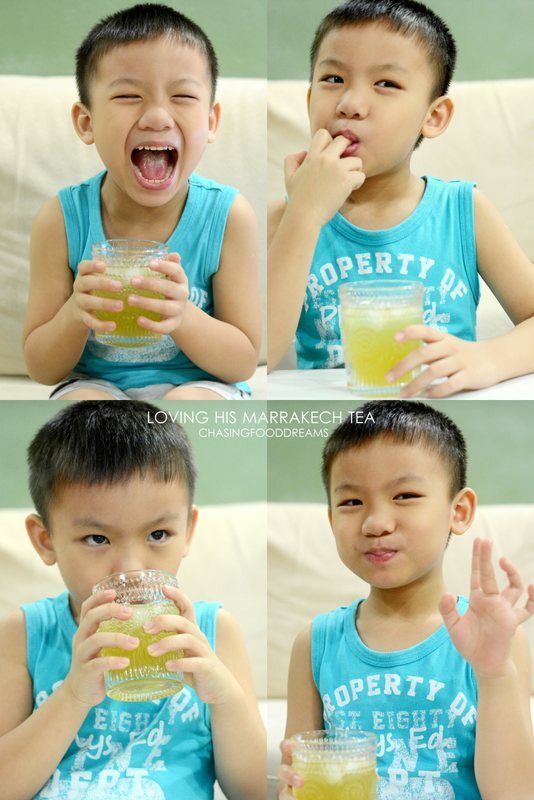 It’s also perfect for the coming Hari Raya or any festive season to serve up plenty of ice cold Marrakech Tea to the young ones and hot Marrakech Tea to the elderly to quench their thirst, especially in this hot and dry weather. I am thoroughly sold on making a great cup of tea in my own home now so I can’t wait to try out other coffee and tea flavours from NESCAFÉ Dolce Gusto. 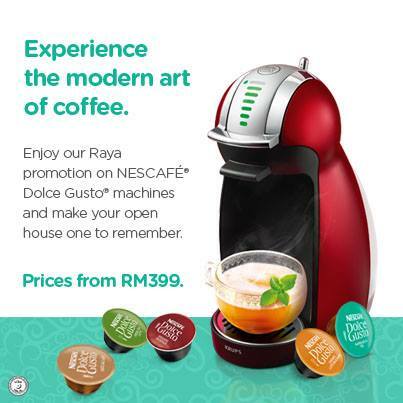 Catch the Raya promotion on NESCAFÉ Dolce Gusto machines to savor a cup of freshly brewed coffee and tea in the comforts of your own home!